A new friend joined the family this weekend. 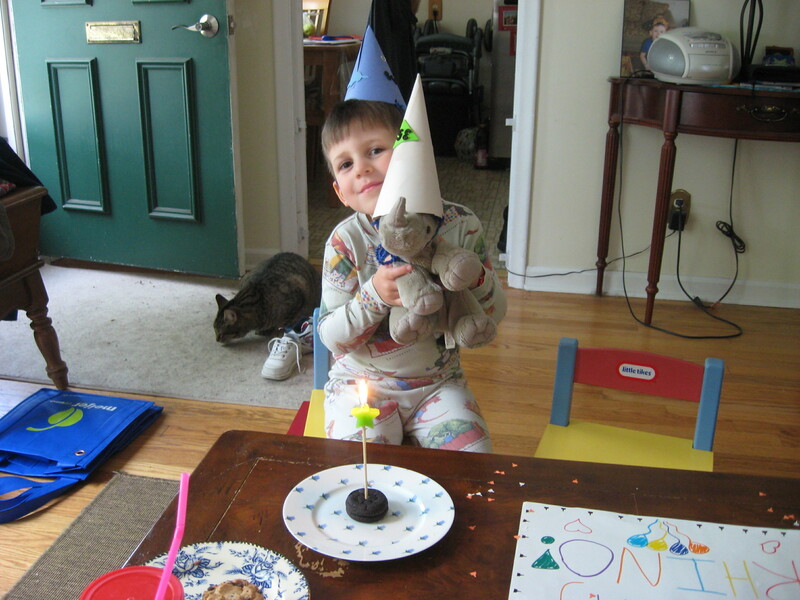 He is Dill the Bear from Clare Garland’s new book Knitted Bears. Ours has yet to be named, Little Man wanted to name him after himself but then decided that would be silly. So the bear is sitting on my bed nameless and waiting for clothes. Knitted Bears has some really cute patterns for outfits so i am looking forward to making them especially the ones for the girl bears-which i plan on making for myself in the near future. Knitted Bear, originally uploaded by Craftydiddl. Made for: Little Man-he wanted him so bad so i made a bear for him first but really i should have stuck with my instinct that the bear would only be cool for a couple mins. he will be cool for another couple mins after he has clothes 🙂 but that’s always how it is with kids. There is a lot of seaming-i think with the next bear i want to try and do some of it in the round if i can-and in one color!!!! My arms were fixable because i could manipulate them more but on the legs only the feet get stuffed so thy have cute dangly legs and you can really notice the curving. In the book she does her seaming with the right sides together and then you turn them around. i didn’t do that because it was to hard to match the stripes so i mattress stitched everything and i don’t thik that helped my curving either-i tend to pull my mattress stitch a bit tight-Basically everything was working against me on this one-i kept doing silly things that i should know better by now. When i was first done i really didn’t like him but he since he has been sleeping in my bed since Saturday he has grown on me. i did make one other change-in the book she sews a bead onto the felt eyes and i used a safety eye instead, it saved me from having to sew the felt on. How was everyone’s Memorial Day? I did some knitting in the morning and then cleaning in the afternoon. 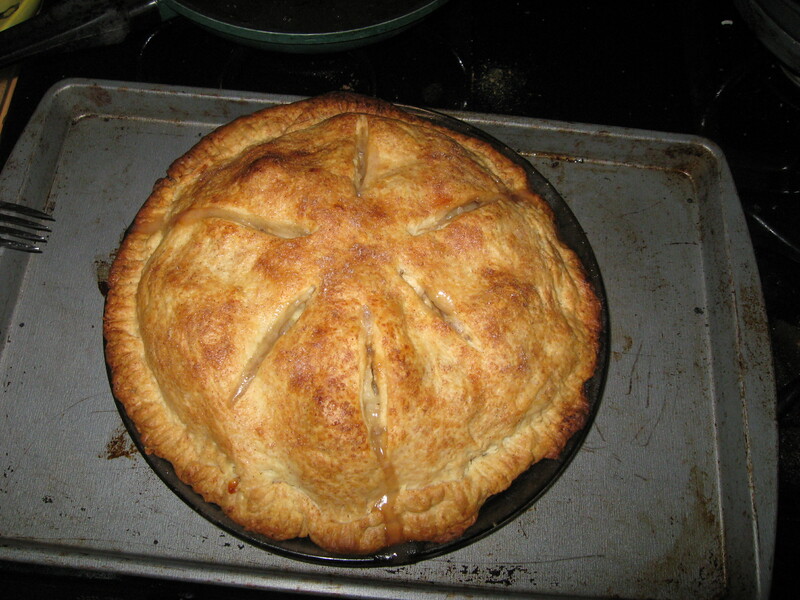 Right now i have a Apple Pie in the oven-I have never made one before so hopefully it turns out. I am using Apple Pie 1 recipe from th Joy of Cooking book. Time to take my pie out of the oven. LOL @ naked nameless bear! 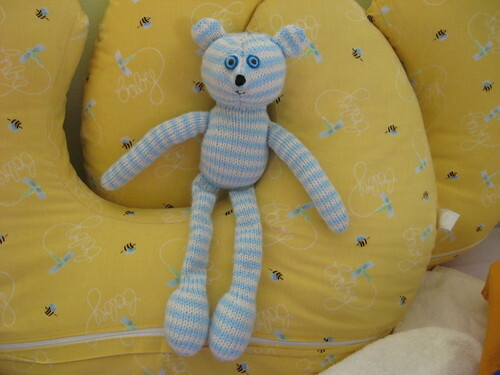 Just thought I’d say Hi, I’m really into knitting these bears at the mo – I’ve done Bilbry – altho he was re-named Boris and I put a bit of stuffing in the legs. I didn’t use a bead for the eye either. Dill looks lovely.